The actor Iwai Hanshirō V was a famous onnagata in his day. 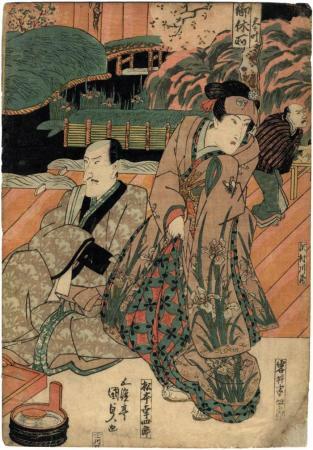 In this print he is wearing a kimono decorated with irises and butterflies. Irises appear in the scenery in the background, too. This is a clue which will be solved later. The title which is seen in the upper right corner of the right-hand panel, not shown here, is 大當三階花見図.